Shamrock Rovers will have to look to Dalymount, or Derry, for someone to challenge them for the league title this season, as last night was yet another evening when everything went the way of the Hoops. 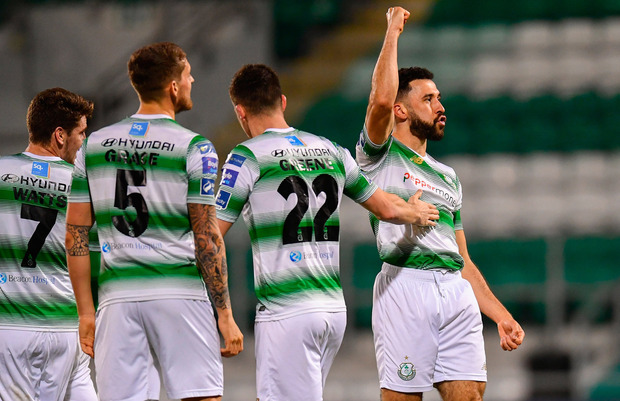 A comfortable 2-1 win at home to Waterford, where the scoreline cannot do justice to the extent of which the table-toppers were in charge, meant that Stephen Bradley's side did their bit. A goal in each half, from winger Sean Kavanagh and defender Roberto Lopes, put Rovers in control, and an injury time header from Blues striker Aaron Drinan was a mere consolation. But defeat for Dundalk in Sligo, and dropped points for Cork City at home to St Patrick's Athletic, means that the two clubs who have dominated the domestic honours for the last six seasons are all but out of the title race, Dundalk a stunning 13 points behind. Bohemians and Derry City are the sides closest to Rovers, they happen to be two of the next three opponents for the Hoops, and unless that duo can come up with something to end Rovers' winning run, the Tallaght club's dominance could last for a while yet this season. There were rumblings in pre-season about the lack of front men in Stephen Bradley's squad, and the main striker in the Rovers panel, Aaron Greene, has indeed scored just twice in 10 appearances this season. But manager Bradley has enjoyed being able to poke fun at those who wondered about the balance of his squad as the midfield and defence have delivered goals time and again, as they did last night. Waterford had managed to take points off Rovers last season, but they came to Tallaght Stadium with a big of baggage, a heavy beating, 4-1 by UCD, on their previous trip to Dublin only a week earlier. The Blues have been erratic this season while the Hoops have been blemish-free in recent weeks and that was the story of the game, Rovers in control from early on in front of a crowd of 2,821. Waterford did actually have some possession, and potentially some good moments early on, a shot on three minutes from Zak Elbouzedi and another effort four minutes later from Bastien Hery, but both efforts were well wide. Rovers never looked like they were about to panic or lose their cool, content with gentle prodding from midfield for their chance to come while Waterford looked nervous. A slip in possession, in the box, by Damien Delaney as he tried to clear a Ronan Finn cross led to a corner for the home side but nothing came of it. But Rovers grew into things, a note of intent when Blues defender Maxi Kouogun had to clear when Aaron Greene was in a dangerous area on 23 minutes. And it took just 26 minutes for the breach to come. Some clever play on the left allowed Trevor Clarke send in a cross and left winger Sean Kavanagh had time to compose himself and send a shot past Matt Connor, the second league goal of the season from Kavanagh. With Jack Byrne's trickery on the ball Rovers were a constant threat and only for Kougoun's efforts, Rovers would have scored again on 39 minutes, a Finn ball setting up Greene but former UCD man Kouogun cleared off the line. Rovers owned the ball for long spells as Waterford could just got get any relief, Finn going close with an effort on 60 minutes which needed a save from Connor, who was beaten again on 67 minutes, Lopes with a header from Byrne's corner, and it took Waterford until the 72nd minute, with sub Izzy Akinade, to have a shot on target. Alan Reynolds' side did get on the scoresheet, Drinan on hand as Lee Grace hesitated while trying to clear a cross by Akinade, but while the scoreline looks good for the visitors, they were never really in the game. Weary Waterford have to try and regroup for Monday's trip to Sligo but it's all smiles for a Rovers side who enjoy their status as top dogs.